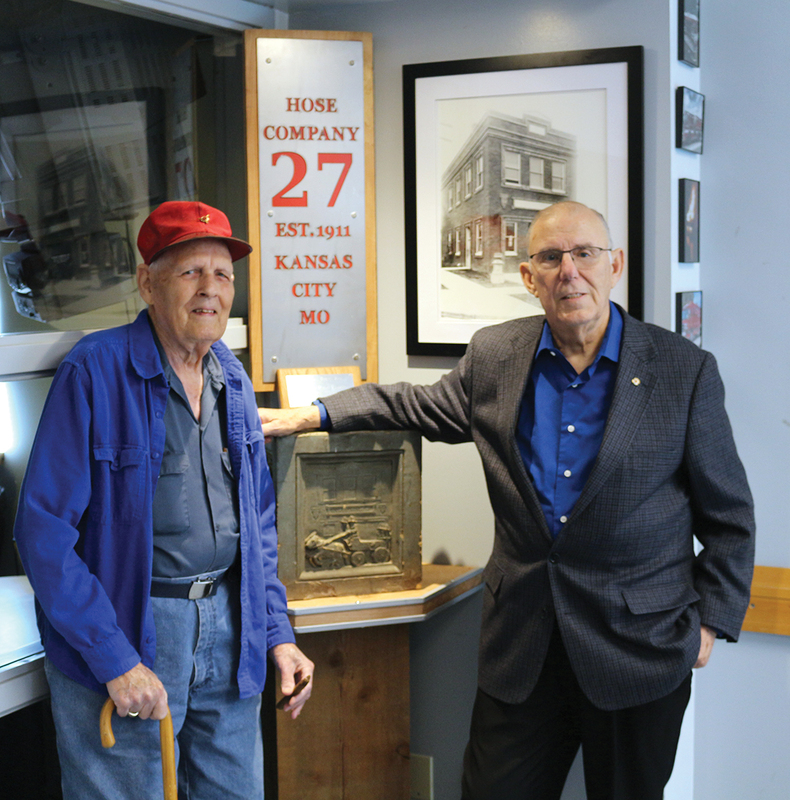 “I didn’t know they’d make such a big fuss over a piece of rock,” Howard Geelan said as he joined firefighters at Kansas City Fire Department Station 27 (Truman Rd. & Bennington Ave.) for lunch on October 24. “I had this stone in the basement for years and one day I thought well, no need for it to sit there. Nobody can see it, nobody knows it’s there,” Geelan said. The stone he referred to was once part of a decorative flower pot that sat outside the fire station years ago. Geelan called the museum at Union Station, but could not get an answer, so he called the Nelson Atkins Museum of Art, who showed some interest. He finally got in touch with someone who pointed him in the direction of Ray Elder, historian for the Kansas City Fire Department. Elder shared the story Geelan told him about a decade ago. Howard was about 9 years old in 1939, or 1940. He would often visit the lot across the street from the fire station, they called it “the dump”, and look for scrap metal, and other interesting things, to sell. Durban Corporation, the junk yard on 12th Street on the west side of the cemetery, would normally buy the scraps of steel. One day he saw a block laying in the median between the sidewalk and the street. He recognized that it was from firehouse 27 because of the inscription, so he went home to get his wagon. When he returned, young Geelan realized he couldn’t lift the block, so he laid his wagon on its side and scooted the block into it, and then was able to turn the wagon upright and pull it home. In 1993, the original Station 27 was torn down. It was rebuilt and went back into service in March of 1996. Elder bargained with Geelan and ultimately bought it for around $50. He then took it home and kept it for 6 years, until he visited Station 27 to share the history of the department. He told the firefighters about the block and they convinced him to bring it up. “Especially Joe Ferrara, the captain, got all excited so I said okay, I’ll bring it out. So I brought it out and I give it to him, and I said, ‘I’m going to check on you in about a year to see if it’s still in the closet downstairs or something.’ Elder said. “He said he’d let me know when they had a place to put it, I forgot about it the last couple, three years, then he called me the other day and said, ‘I’d hoped I was able to get ahold of you.’ Well, I haven’t passed away yet,” Geelan said. He was joined by family, friends and neighbors to take a tour of Station 27 and meet the firefighters on October 24. Station 27 is home to KCFD’s Hazardous Materials Team (Hazmat). The first Hazmat team in the city went into service in 1989 following the explosion in south Kansas City that killed six firefighters. Pumper companies 30 and 41 were lost in the explosion. To honor them, the numbers were added together and Hazmat 71 was formed. The block is displayed in the upstairs dining room of Station 27, surrounded by photos from the station’s and the department’s history, dating back to the very beginning, with a plaque thanking Elder for its return to its original home. Elder, who was a firefighter for 35 years, has been working on the Kansas City Fire Department Museum’s new location at 7309 Troost. When it opens, it will house one of the antique trucks Geelan remembered from childhood. KCFD switched to all mechanical in 1919. The other is a 1927 Ahrens-Fox, like the one Geelan remembered with the big silver ball on the front-the pulsation chamber- which ensured that a steady stream of water was produced when the pistons pumped the water. Now, almost 80 years later, the last remaining piece of the original station that Geelan admired so often as a child has been returned.